A referendum on joining the European Union was held in Norway on 27 and 28 November 1994. But, the "No campaign" won the referendum. One of the reason was that, Norway has an economy based on natural resources (oil and fish), meanwhile the European union mostly consist of industrial countries. What would Norway have lost in case of joining to EU then? The common fisheries policy is a EU wide system for managing fish stocks in the waters around the EU. It intends to give all EU fishing fleets equal access to EU waters. If Norway were to join the EU it would have to join the CFP. Outside the EU, Norway can control its own waters, which are rich in natural resources. The right of access to EU fisheries may not compensate for the increased competition from other nations. Although the 'No' vote won the 1994 referendum in Norway it's worth looking at the actual voting figures. This shows that 47.8% were in favour of joining, and 52.2% were not. So the vote was very close - a 2% swing would have resulted in a tied vote. What this means is that as a whole, Norway was split evenly between the two sides and hence unsure of which policy was best to pursue. Norway's economy need not have lost out by joining the EU by negotiating protections for what they considered vital parts of their economic infrastructure from what they might take as as unfair competition from larger, more industrialised and more wealthier European nations; after all, there are protections already built into the Common European Fisheries Policy; this policy allows equal access to all European waters for any European fishing fleet; however, the traditional fishing grounds of fishing fleets are protected by two boundaries - within twelve nautical miles of the coastline, and also within a hundred nautical miles. This protection is due to lapse in 2022; but at the time of the referendum - in 1994 - this would have been a generation away; Norway, could have argued by virtue of its high reliance on their fisheries, this protection should last in their case, rather than thirty years, say fifty years; this gives them plenty of time to adjust; instead, by putting themselves outside of that framework, Norway has lost the right of shaping that framework. Having said that, Yannis Varoufakis, the ex-finance minister of Greece - another small nation within the EU - has lambasted the EU for its opaque structure, and its democratic deficit; his solution is not to withdraw from it, but to reform it. One thing Norway would have lost is the sovereignty over its fisheries policies. It's not so much that the impact would have necessarily been negative on the economy as a whole but fisheries (very much including whale hunting, no matter how small that activity may be economically speaking) are a hugely symbolic issue. In fact, Norway's current quasi-membership (through the EEA and EFTA) forces it to contribute to the EU structural funds (the so-called “Norway grants”) and to implement most of the single market rules with little to no influence on the making of these rules but it preserves the country's autonomy regarding agricultural policies and fisheries. Finally, Norway's oil wealth means that EU membership and participation in the single market is somewhat less important for the country than it is for EU member states. It's not so much that they stand to lose a lot but simply that they can maintain a high revenue without it (that's the point behind the natural resources vs. industrial countries comparison you heard about it). While Sweden's decent as described above began in 1975, which predates their EU membership, given the EU's immigration policy requirements, the results would undoubtedly be the same. If Norway joins the euro, first and foremost, she will lose her most important asset, which is her national currency, that is, her sovereignty and control of her economy via her own monetary policies. That is enough to guarantee a downward spiral for the people of Norway, like every other EU country has experienced, except a couple ones -mostly Germany, that take advantage and gain a lot from the downfall of the indebted southern countries, like Greece, Spain, Ireland, Portugal, Italy, but even northern ones like France also suffer from the EU policies. Germany is in good shape (although even the German people have lost a lot), because of that factor and because of unequal treatment -like borrowing with zero or negative interest in contrast to those countries. Meanwhile, the eurozone is very fragile and this is why Germany has bought huge amounts of gold the recent years. For example, recently Italy was prevented from taking a turn against the euro and its policies as is the wish of the majority of its people, with the president Sergio Mattarella violating the article 92 of Italy's constitution (which was considered a coupe), preventing Paolo Savona (an anti-euro economist) from becoming finance minister and suggesting a government of "technocrats" instead (=bankers). After the intense reactions of the Italian people, a second order was given to Giuseppe Conte instead to form a government, but Giovanni Tria, a pro-euro economist was given the position of finance minister, so EU got back the wheel of Italy's economy. 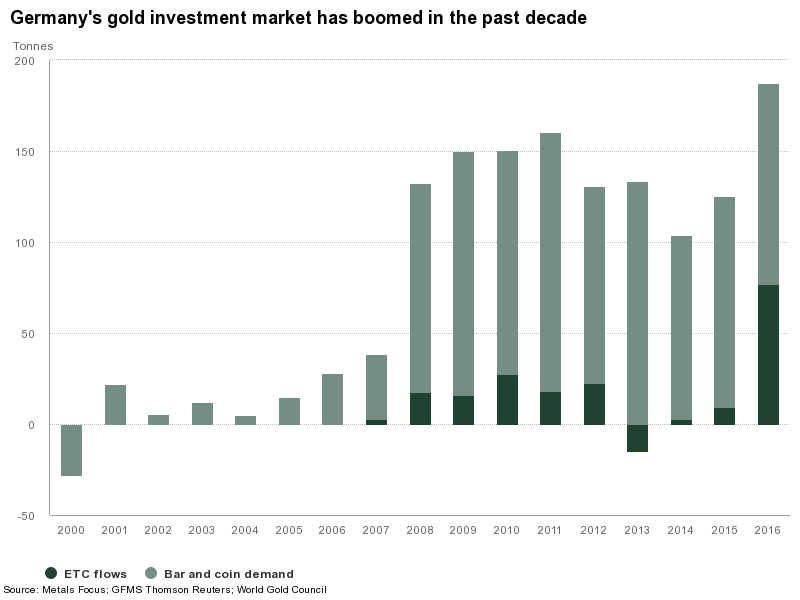 Those hundreds of tonnes of gold per year are bought mostly by banks and between them a national one (KFW) that is the main stockholder in companies like Deutche Telecom. If the euro and eurozone is solid and has a bright future, why the strongest oligarchy in Germany buys tonnes of gold? Not the answer you're looking for? Browse other questions tagged european-union norway or ask your own question. What is the EU stance on letting the UK stay in the single market after they leave the EU?